Ruland now offers stepped bore rigid couplings with standard keyways in each bore. The couplings are two-piece style allowing for easy assembly and disassembly without moving other components. Hardware is opposing for balance, allowing for higher speeds with reduced vibration. Rigid couplings are often used to connect motors to shafts where misalignment is neither present nor desired. 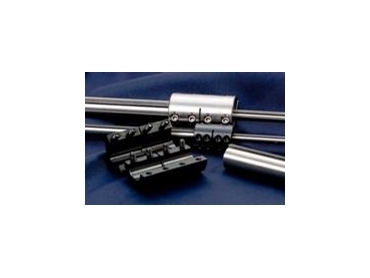 Since these couplings have zero-backlash, they are ideal for motion control applications. Shaft to shaft connections are another common application for rigid couplings. Keyways increase the torque capacity of the coupling by creating a positive drive while also ensuring precise rotational positioning of the shafts. The added torque capacity provided by the keyway may be needed in applications with shock loads due to sudden starts and stops or reversals, when the bore is small relative to the coupling OD, when the shaft may be undersized, or when temperature changes may alter the size of the shaft or the bore in application. Precise rotational positioning may be needed in applications where phasing of the shafts is important for timing. Ruland rigid couplings are offered in one- and two-piece styles in aluminium, black oxide carbon steel, and stainless steel with bore sizes from 3mm to 50mm in the metric series and 1/8“ to 2“ in the inch series. In addition to stepped bore couplings with keyways, straight and stepped bore couplings without keyways are also offered. Straight bore couplings from Ruland feature precision honed bores for tighter fit and alignment. Ruland rigid couplings are supplied with Nypatch hardware that resists loosening under vibration. Rigid couplings are part of Ruland’s complete line of shaft collars, rigid couplings, and motion control couplings. All Ruland products are stamped with the Ruland name for easy identification.